- High quality raw material used . - Can choose your favorite colours . 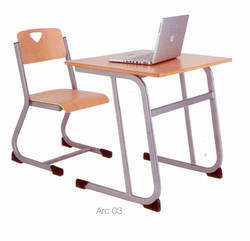 Single Student box type Desk made in CRC round pipe, top made in Plywood and Sunmica, Seat and Back made of Compressed Plywood. Single seater desk made out of 25mm x 16swg Round MS tubular section, duly powder coated with book shelf. Desk top made out of 25mm thick Pre laminated board with 2mm PVC edge beading. Chair:-Polypro line shell with MS powder coated under structure. MS structure made out of 19mm x 16swg round tubular section. 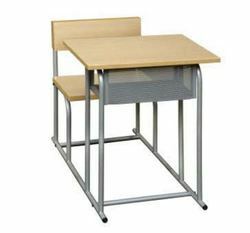 Enriched by our vast industrial experience in this business, we are involved in offering an enormous quality range of Single Seater Student Desk. Product prices: Our product range starts from 1800rs. and it will be vary according product specification.